Having crossed the threshold of 50 million users, cloud software company Evernote has in the last few months reached into a fundamentally different realm: Selling physical goods. It started simply enough with paper notebooks from Moleskine. It was a logical connection, given that a standard Evernote feature is the ability to capture written notes or printed documents using a smartphone camera. But, in September, more items followed, some equally logical, some less so. There’s now an Evernote-branded scanner and Evernote-ready Post-It notes. And specially designed messenger bags, backpacks and a wallet. It’s a counterintuitive move for a software firm aiming to help you organize your life with a sort of “external brain” that goes everywhere. So, when I got a chance to meet with CEO Phil Libin in New York last month, I wanted to drill down on his reasoning for the sudden shift. Why would a software company take on the added cost and complexity of selling what amounts to a lifestyle brand? We ended up talking for about 90 minutes. I had a lot of questions, in part because I’m a longtime customer, having used Evernote for about four of its five years of existence, but also because there’s just so much going on with the company. Below is the first of a two-part summary of our conversation. We happened to meet on the same day that Evernote announced a significant partnership with Salesforce.com, which is what I asked about first. AllThingsD: So let’s start with the news. You announced an integration deal with Salesforce.com. What’s that all about? Phil Libin: We are built into Salesforce1, which is their new mobile platform. We built Evernote for Salesforce, so in the Web app you could basically embed Evernote so you can see notes related to Salesforce records, and vice versa. And now it’s available on their mobile app. We built the integration so that parts of their app can call Evernote natively, and vice versa. It’s a pretty smooth integration between the two. Evernote Business has been growing really fast, and a big part of that was because of the integration we started several weeks ago. 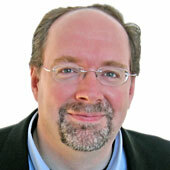 At a high level, where does Evernote Premium end and Evernote Business begin? It’s a good question, because the biggest competition for Evernote Business is just Evernote, the free version. And they all cannibalize each other. Evernote Business is really designed to be used within a company. It’s more of a team-oriented product. It gives you features that help you get better situational awareness regarding what your co-workers are working on. If it were a videogame, Evernote Premium is the single-player version, and Evernote Business is the multiplayer one. The other big change came at your user conference in San Francisco in September. You announced a lot of physical products, and I read that you’re embracing this notion of Evernote as a lifestyle brand. How did it all come about and where are you taking it? As we were ramping up to this launch, I told everyone inside the company that all this was going to feel very strange, until one day it becomes the most obvious thing in the world. The idea is that we want to be the signature brand for modern knowledge workers. We want to be the brand that you think of when you think about living life more productively. We want to make the products that make the modern knowledge worker more productive. That’s been the vision from the beginning. We want to be your external brain. So the first thing we did was the partnership with Moleskine. That went well. Then there’s the partnership with 3M around the Post-it notes. The other product that is selling well is the Evernote Scanner. It’s a Fujitsu ScanSnap that we’ve done some custom design work on. That was actually the first product. We’ve been working on that for two years. How is that scanner different from the others? There are numerous ones out there that will already scan straight into Evernote. We worked with a bunch of different scanner companies, and that was an important step forward, to get one-button-scan-to-Evernote. But it was still sort of clunky. We wanted to basically take the best scanner in the world and customize it in every way. We worked with PFU at Fujitsu. We started with the physical look and feel, down to the texture. We wanted to get rid of all the software that typically comes with a scanner, all the CDs with drivers and all that. Here, there’s no configuration. You buy it, you plug it in, and it just works. We got rid of all the software and rewrote the firmware. The scanning experience is great. You can take business cards and regular pages, and receipts, and put them in the scanner, and everything gets scanned to Evernote and separated based on what it is. If it’s a business card, it automatically looks that person up on LinkedIn, and so it’s basically meant to take everything on your desk without any intermediate steps. You’ve been able to do this in broad brushstrokes for awhile, but it takes a lot of set-up and configuration. In a hundred little ways, this is a slightly better experience, but they all add up to a much better experience overall. 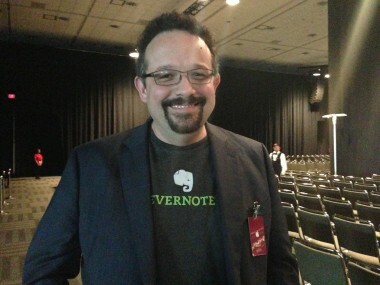 But Evernote is, at its core, a software company. And now you’re selling physical goods. There’s a scanner. There are bags, backpacks, wallets and even socks? How do you reconcile those things? Selling physical products is a break from tradition in some ways, but it’s fundamentally consistent in other ways. What we’re trying to keep consistent are the business model and the customer base. The business model is direct. We experimented early on with doing advertising, but we really backed off all of that. We decided we only wanted to make money directly for products that people pay us to use. We don’t want to build in any inherent conflicts of interest. We don’t want to do any data-mining or affiliate stuff. We’re not a big-data company. We just want to make products that people pay for. They’re modern knowledge workers, who either make decisions on their own to get Evernote, or they work for companies who do. But it’s physically the same group of people. I think it’s more important to be true to those things. Those people interact with our brand because they see Evernote as a better way to do things. And it’s all direct, straightforward revenue. I have no problem going from software to hardware to content, as long as it’s for those people, and the revenue is direct. So, it’s about playing to the base — a core audience, if you will? It’s about building a brand. When we started the company five years ago, we talked about building a 100-year startup. We’re really serious about that. It’s impossible to know what the products look like in 95 years. But I know what I want the brand to look like in 95 years. I want it to be the most important brand in the world for people who self-identify and aspire to being smart and productive. It’s like a Nike for the mind. Nike is the world’s most successful brand for people who aspire to and identify with being athletic. We want Evernote to be the same thing for people who are all about their minds. As long as we focus on the brand, the products will fall into place. So, where do you place the limits? Where would you not want to take the brand? There are bright lines that we won’t cross. We wouldn’t do anything where we’re seen as trying to make money from people’s information. Not that there is anything inherently wrong with that, but to us it violates trust. Anything you put into Evernote is private, and it’s yours. We wouldn’t do anything that requires an indirect business model. That probably limits us from a lot of opportunities, like most social things, most content things, most entertainment things. We want to make it for knowledge workers, which is the fastest-growing, economically significant demographic everywhere in the world. Twenty years ago, if I said “knowledge worker,” it meant bankers and journalists in New York and London. Now it’s very big. It’s for those people who don’t have a lot of separation between their personal and professional lives, but instead integrate them. That didn’t used to be a lot of people, but now it is. Not just in the U.S., but everywhere.